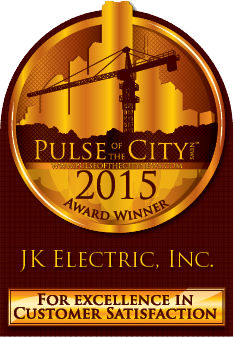 Since 1998, JK Electric, Inc. has been a locally-owned and operated electrical company, serving Lincoln and surrounding areas. Through the years we have created a successful business based on strong, friendly relationships with our customers and strong, family relationships with our team of employees. We pride ourselves on high-quality work matched with genuine hospitality; and that the job will be done right the first time. If the job is not done to your exact specifications, we will adjust to meet your desires. Our employees show pride in their work unique to JK Electric, Inc. You will always know who’s showing up at your door by the personalized company vehicles and uniforms. Drop cloths, shoe covers and trucks outfitted with cordless vacuums to keep your environment clean while getting the job done. Properly stocked service vehicles ensure we do not have to leave the job site until completion — saving you time and money. The electrical education is continuous with in-house code classes and technique lessons given to all our employees. Not by requirement, but because of their drive to become better electricians for the people we serve. JK Electric, Inc. offers a wide variety of electrical services which include remodeling and new construction of residential, commercial or industrial projects. We will help you with anything from your lighting needs to a new service or fixing a switch to adding another one. Nothing is too big or small for any one of our construction, service, or residential crews. We will even help you design your space to fit your needs. Our goal is to please the customer each and every time. A+ Members of the Better Business Bureau since 2006. ABC Step Award Gold level winner.